LASIK is a form of refractive surgery that is performed to treat ocular conditions like myopia, hyperopia, or astigmatism. LASIK stands for laser-assisted in-sit keratomileusis. It is an outpatient procedure that has become popular among people who are looking to be lesser dependent on contact lenses or glasses. These surgeries help improve people’s vision by using a laser that reshapes their corneas. Patients who desire LASIK eye surgery in Rochester Hills, Michigan should contact the office of Dr. William Goldstein. Who should choose LASIK eye surgery? If you’ve been wearing glasses or contact lenses for most of your life, you’d understand how inconvenient it can be for you. People who are interested in sports, adventure sports, driving, flying planes, etc. find it the most frustrating to have problems with their vision. They have to depend on glasses or contact lenses for clear vision, and this sometimes can cause a hindrance to their activities. If you’re someone who is tired of depending on contact lenses or eyeglasses, then you make a good candidate for LASIK surgery. However, it is not considered the most appropriate option for vision correction. Like all surgeries, LASIK also carries some amount of risk, and it’s important that people who choose to undergo this procedure are aware of those risks. Make sure that you speak to a qualified doctor or surgeon before you decide to undergo LASIK surgery. When should you consider LASIK surgery? This operation is designed for people who suffer from some form of refractive error such as myopia or nearsightedness, hyperopia or farsightedness, and astigmatism. Myopia is a condition where people can see objects close to them, but objects in a distance appear blurry. Hyperopia, on the other hand, helps you see distant objects clearly, but objects close by appear blurry. Astigmatism causes overall blurry vision. Your doctor will analyze your eyesight and conditions before they declare you an eligible candidate for LASIK eye surgery. A good outcome from the surgery depends highly on the evaluation conducted by your doctor. 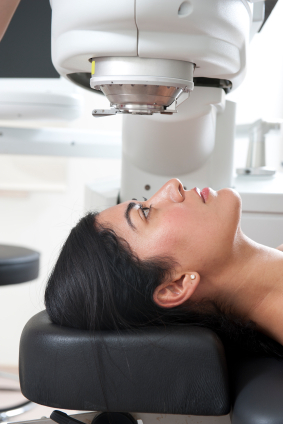 What risks does LASIK eye surgery carry? As you’d have noticed, every medical procedure carries some risk. With LASIK, you might experience risks such as overcorrection, undercorrection, or additional astigmatism. This occurs when the laser takes away too much or too little tissue from your eyes. LASIK can also cause vision disturbances such as night blindness or double vision. It can temporarily reduce the production of tears. The most serious risk involved with LASIK is vision loss. All these indicators make it important that you discuss the LASIK eye surgery procedure, healing, risks, and complications with your doctor before you make a decision.